The cinema of Morocco refers to the film industry in Morocco. 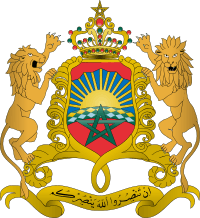 In 1944, the Moroccan Cinematographic Center (CCM), the nation's film regulatory body, was established. Studios were also opened in Rabat. More recently and since the year 2000 a new and younger generation are taking over. Laïla Marrakchi (her first	full-length feature film, Marock, produced in 2004 was nominated at the Festival de Cannes 2005 category "Un certain regard"). 1 2 "Bilan cinematographique 2012" (PDF). Centre Cinématographique Marocain. Retrieved 14 November 2013. ↑ "Country profile: 2. Morocco" (PDF). Euromed Audiovisual. p. 114. Retrieved 14 November 2013.